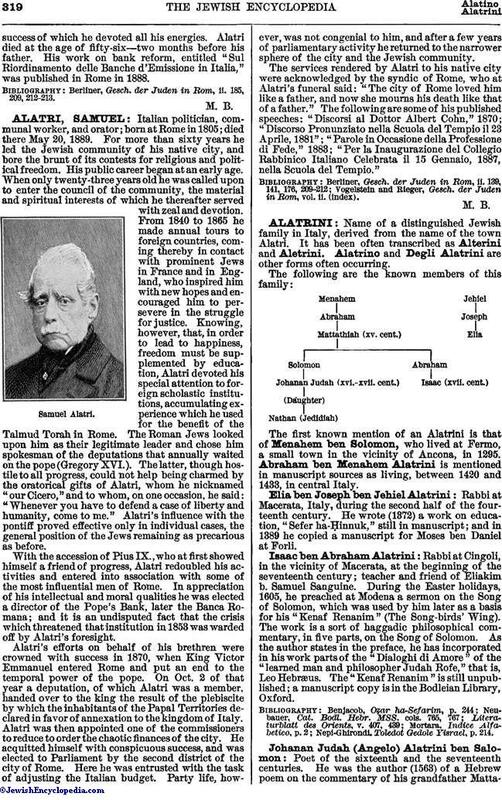 Name of a distinguished Jewish family in Italy, derived from the name of the town Alatri. It has been often transcribed as Alterini and Aletrini. Alatrino and Degli Alatrini are other forms often occurring. The first known mention of an Alatrini is that of Menahem ben Solomon, who lived at Fermo, a small town in the vicinity of Ancona, in 1295. 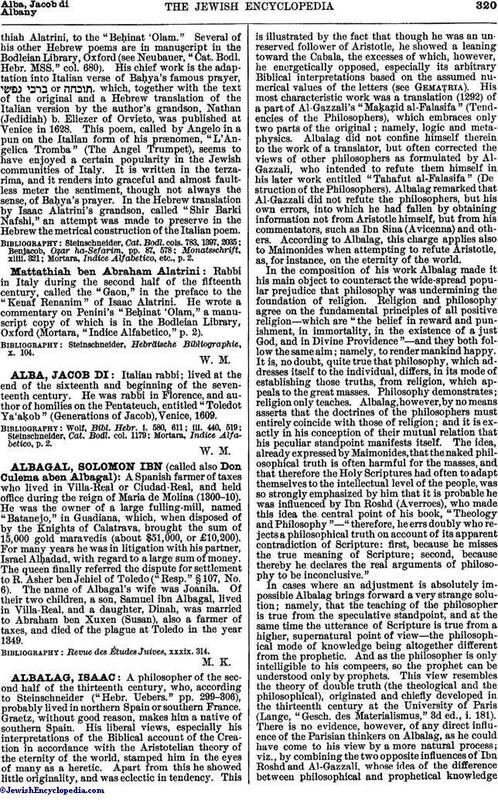 Abraham ben Menahem Alatrini is mentioned in manuscript sources as living, between 1420 and 1433, in central Italy. Rabbi at Macerata, Italy, during the second half of the fourteenth century. He wrote (1372) a work on education, "Sefer ha-Ḥinnuk," still in manuscript; and in 1389 he copied a manuscript for Moses ben Daniel at Forli. Rabbi at Cingoli, in the vicinity of Macerata, at the beginning of the seventeenth century; teacher and friend of Eliakim b. Samuel Sanguine. During the Easter holidays, 1605, he preached at Modena a sermon on the Song of Solomon, which was used by him later as a basis for his "Kenaf Renanim" (The Song-birds' Wing). The work is a sort of haggadic philosophical commentary, in five parts, on the Song of Solomon. As the author states in the preface, he has incorporated in his work parts of the "Dialoghi di Amore" of the "learned man and philosopher Judah Rofe," that is, Leo Hebræus. The "Kenaf Renanim" is still unpublished; a manuscript copy is in the Bodleian Library, Oxford. Nepi-Ghirondi. Toledot Gedole Yisrael, p. 214. Poet of the sixteenth and the seventeenth centuries. 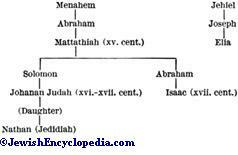 He was the author (1563) of a Hebrew poem on the commentary of his grandfather MattathiahAlatrini, to the "Beḥinat 'Olam." Several of his other Hebrew poems are in manuscript in the Bodleian Library, Oxford (see Neubauer, "Cat. Bodl. Hebr. MSS." col. 680). His chief work is the adaptation into Italian verse of Baḥya's famous prayer, or , which, together with the text of the original and a Hebrew translation of the Italian version by the author's grandson, Nathan (Jedidiah) b. Eliezer of Orvieto, was published at Venice in 1628. This poem, called by Angelo in a pun on the Italian form of his prænomen, "L'Angelica Tromba" (The Angel Trumpet), seems to have enjoyed a certain popularity in the Jewish communities of Italy. It is written in the terzarima, and it renders into graceful and almost faultless meter the sentiment, though not always the sense, of Baḥya's prayer. In the Hebrew translation by Isaac Alatrini's grandson, called "Shir Barki Nafshi," an attempt was made to preserve in the Hebrew the metrical construction of the Italian poem. Mortara, Indice Alfabetico, etc., p. 2. Rabbi in Italy during the second half of the fifteenth century, called the "Gaon," in the preface to the "Kenaf Renanim" of Isaac Alatrini. He wrote a commentary on Penini's "Beḥinat 'Olam," a manuscript copy of which is in the Bodleian Library, Oxford (Mortara, "Indice Alfabetico," p. 2). Steinschneider, Hebräische Bibliographie, x. 104.